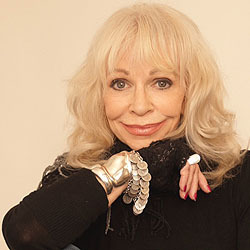 Katy Manning’s career spans over 50 years and three continents. Beginning with John Braine’s groundbreaking TV series Man At The Top, from this she landed the coveted role of Jo Grant in Doctor Who opposite Jon Pertwee. She has since been discovered by a whole new generation in 2010 by her appearance in The Sarah Jane Adventures alongside Matt Smith and the late Elizabeth Sladen. Douglas Camfield (director of many Doctor Who stories) cast Katy in an Armchair Theatre – The Golden Road and Target in two very different roles from the innocent Miss Grant. Katy’s early television career also found her hosting the arts & crafts series Serendipity. In film, she starred in The Haunting of Harry Paine, Don’t just Lie There Say Something (written by Michael Pertwee), Frog Dreaming and Dark Must Fall for which she received best support actress at The Melbourne Film Festival. Katy has worked extensively in theatre performing from West End to The Sydney Opera House in plays as diverse as Hamlet, Why Not Stay For Breakfast, There’s A Girl In My Soup, The Odd Couple (Jack Klugman and Tony Randall), Blithe Spirit, Otherwise Engaged (Martin Shaw), Run For Your Wife (Eric Sykes and David McCallum), How The Other Half Loves, Bedroom Farce, Educating Rita and a season of Tom Stoppard plays at the Young Vic and Chichester Festival with Out of the Blue and Duet for One. Katy performed her one woman show Me And Jezebel, a true story of Bette Davis, across Australia before bringing it to great acclaim to London then the Edinburgh Festival. She has also directed Banjo Patterson, Shirley Valentine and two Australian musicals and even hosted her own chat & preview show for UKTV (Australia). She has voiced many cartoon features & won a Palme D’Or for the role of Gloria’s House. In NY and LA Katy wrote & performed her one woman play Not A Well Woman before recording it with all 26 characters for Big Finish. Katy stars in her own audio series Iris Wildethyme, as well as reprising her role of Jo Grant and as Ecco warrior Jo Jones in the new Unit Series. She has guest-starred in many other audios, including The Confessions of Dorian Gray (Alex Vlahos), Torchwood and Dracula with Mark Gatiss. The series Bakers End with Tom Baker won a New York Audio Drama award in 2017. More recently Katy has done her third Edinburgh Festival with Keeping Up With The Joans, Nobody’s Business at The Kings Head and toured with several plays including Agatha Christie’s A Murder Is Announced.